With only low tier economic events from Europe, it’s no surprise that euro pair price action was mixed and more driven by global risk sentiment & counter currency influences. In short, global risk-off sentiment early in the week is likely the reason why we saw the euro’s performance against the safe haven lag versus the high-yielders/comdolls. 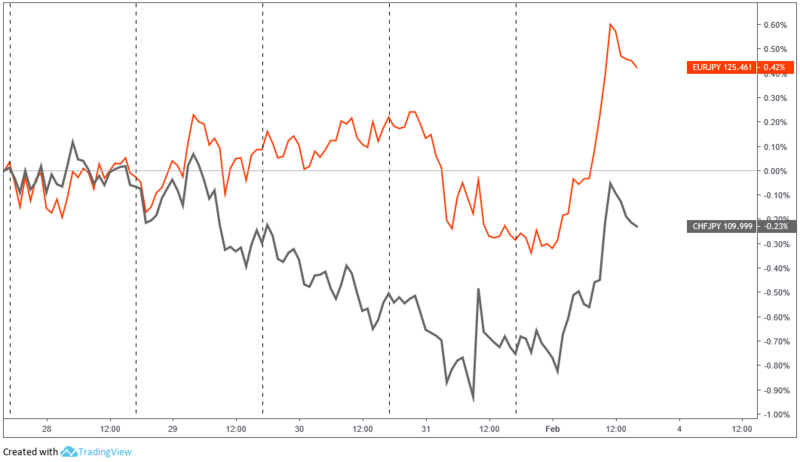 And vice versa at the end of the week when traders were generally positive on risk, the euro underperformed against the high-yielders while out performing the safe haven currencies (JPY, CHF, & USD) at the end of the week. 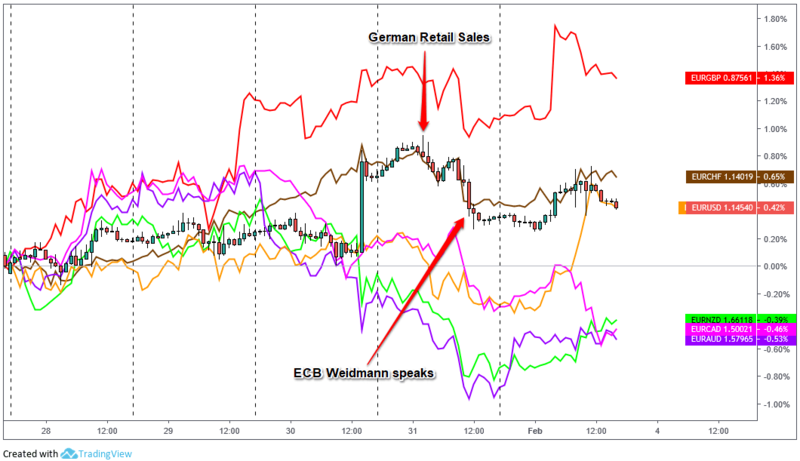 A few hours later, the euro fell broadly once again, this time possibly on dovish comments on the European economy from Bundesbank President Jens Weidmann. He presented a gloomy outlook on Europe and basically made an argument for traders that the ECB is more likely to bring further stimulus rather than normalize monetary policy, as previously expected before data started turning down at the end of 2018. Tough week for the Swiss franc as it not only took hits as broad risk sentiment went positive into the weekend, but we also saw a rare week of economic drivers from Switzerland. 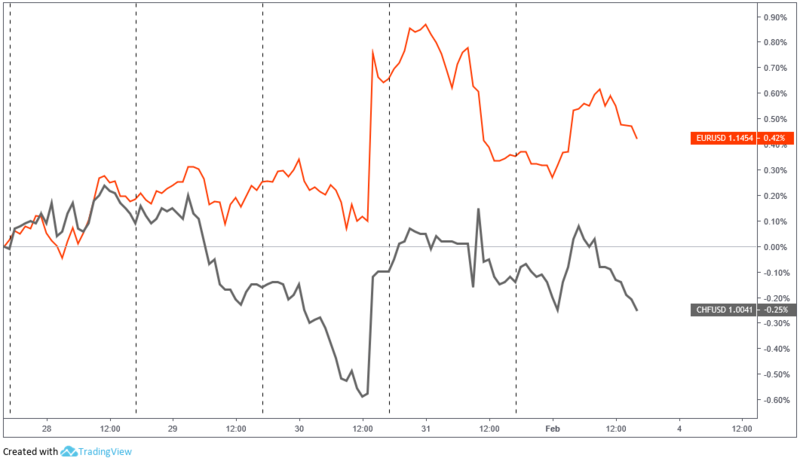 As mentioned in the euro recap above, global risk sentiment started the week in the “off” position, likely the reason why we saw the franc’s performance against the high-yielders/comdolls outperformed against the safe havens through Tuesday’s trading session. 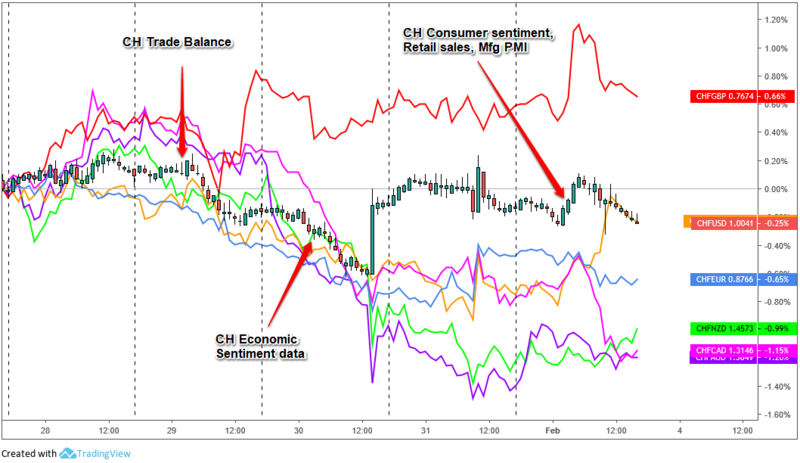 Traders flipped back to risk-on from Wednesday to the end of the week, and the Swiss franc flipped as well where its underperformance against the high-yielders was much greater that its underperformance against the safe haven currencies (JPY, CHF, & USD) at the end of the week. While the franc’s movement did correlate closely with the euro as with most other weeks, it’s clear traders priced in the gloomier outlook that was later seen in the week with the latest KOF Swiss Economic Institute survey and retail sales data, separating the degree of performance between the franc and euro against the other safe haven currencies. Swiss trade surplus narrowed to CHF 1.79 billion in Dec. 2018 from a revised CHF 3 billion in Nov.